Right now it looks like Les Moonves won’t face any imminent consequences for the decades of sexual harassment and assault he perpetrated and enabled at CBS, as alleged by Ronan Farrow’s meticulously reported exposé. The network’s board of directors met today and after careful deliberation decided to select an outside law firm to conduct an investigation. They took “no other action.” Moonves remains at the reins. To state the obvious, this is not a promising development. He also responded to the common gripe that the #MeToo movement favors witch hunts over due process. “For so long for women in the workplace, there was no change, no justice for the abused,” he said. “So we shouldn’t be surprised that when the change comes, it comes radically. This roar is a natural backlash to all that silence.” Which I suppose is reasonable enough, though it does presuppose that the public exiling of abusers is a radical response, rather than a rational response that just hasn’t happened before. It’s revealing that he set up this observation with a JFK quote, “Those who make peaceful revolution impossible make violent revolution inevitable.” Actually, it’s still just the abusers who are doing the violence in this dynamic, not the people reacting to their abuse. All told, Colbert did not say what he thinks should happen to Les Moonves, who has been accused of forcible touching and kissing by six women, and who reportedly sabotaged the careers of those who refused his advances. No, he left that judgment to the powers above, as though those powers can ever be trusted to do what’s right. And we should be clear that “what’s right” is in no way ambiguous here. The allegations are many and they are meticulously reported. Colbert’s a smart guy; he knows this is the real deal. If he believes the allegations, and if he truly has any of the principles he has professed in his long, successful career, then the only proper course of action is for him to announce that he will not continue working so long as Les Moonves is in charge. 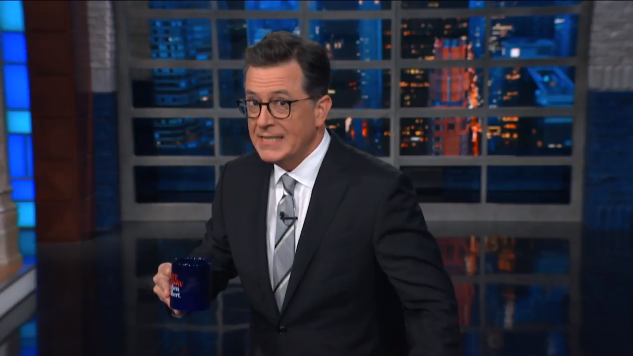 Colbert’s greatest strength as a host has always been his moral clarity. His choices right now are to use it or to go easy on a powerful abuser simply because that abuser is his friend. Like I said: no ambiguity here. If Colbert believes Moonves should be held accountable, then he should hold Moonves accountable himself.